Many of my apps I barely use but still need use up some of my cellular data. I would like to turn the data of for certain apps, but as you can see in the picture it looks ,in a way, tinted. It won't let me turn off the data on the apps or turn it on for apps. I don't know if I'm supposed to click a certain thing somewhere else in the settings. Check if restrictions is turned on in settings -> general -> restrictions. Turn it off and try again. Not the answer you're looking for? Browse other questions tagged cellular-data . 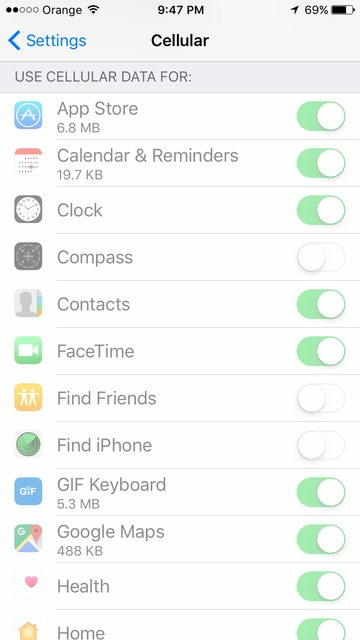 I can't turn off my apps cellular data on my iphone, Help! My iPhone keeps telling me my cellular data is off?